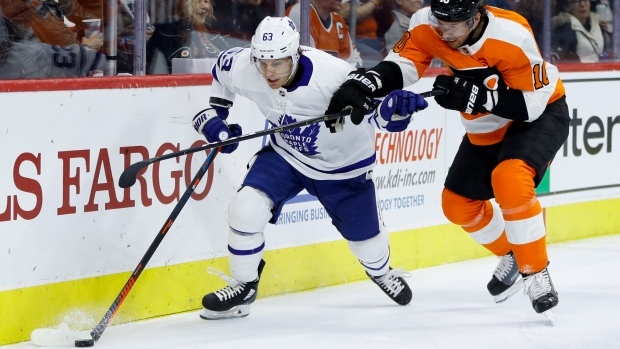 Maple Leafs forward Tyler Ennis has been selected as the team’s nominee for the 2018-19 Bill Masterton Memorial Trophy by the Toronto chapter of the Professional Hockey Writers Association. Each season, the Masterton Trophy is awarded to the NHL player who best exemplifies qualities of perseverance, sportsmanship and dedication to hockey. The 31 nominees, one from every NHL club, will be whittled down to three finalists before the trophy is presented to the winner this June at the NHL Awards show in Las Vegas. All three traits associated with the honour have applied to Ennis throughout this season. When the 29-year-old signed with Toronto last July on a one-year, $650,000 deal, he didn’t know what exactly his future would even hold. But he dedicated himself to rebounding mentally and physically from the difficult three-year span prior, made the Leafs’ roster out of training camp, and established himself as a hard-working and dependable fourth-line player. Drafted in the first round, 26th overall, by the Buffalo Sabres in 2008, some believed that Ennis was too small (5-foot-9, 160 pounds) to find lasting NHL success. The Edmonton native played his first full season with the Sabres two years later in 2010-11, and emerged over the next five seasons as a reliable winger who frequently flirted with the 50-point mark. Ennis had one of his best years ever in 2014-15, tallying 46 points in 78 games, and then spent the next three in a downward spiral. Concussion symptoms cost Ennis all but 23 games in 2015-16, and the following November he was sidelined for groin surgery, playing only 51 games total in 2016-17 and managing a lowly 13 points. The Sabres had seen enough by then, and shipped Ennis to Minnesota in June 2017. By midway through his only season with the Wild, Ennis was a rotating healthy scratch, and would dress in only 73 regular season games and one playoff tilt. He registered 22 points total, and the Wild bought out the final year of his deal. That led Ennis to free agency, and he landed with a Leafs team that prioritize the speed and skill Ennis still believed he could bring. Ennis took that chance and ran with it, making such a mark that head coach Mike Babcock initially tried him on Auston Matthews’ wing in the preseason and to start the regular season, a fill-in for the absent William Nylander. That didn’t last, but Ennis found a comfortable groove on the team’s fourth line, up until he broke his foot on Dec. 22 and was sidelined for six weeks. The 21-game absence was rejuvenating for Ennis, helping him build towards the first hat trick of his 10-year career in a 6-2 win over the Flames in Calgary on March 4. In the final few weeks of the regular season, Ennis has split time with American Hockey League call-up Trevor Moore and recently acquired Nic Petan, but that hasn’t soured his attitude. Babcock said on one occasion when Ennis was scratched that he “didn’t deserve” to be, and Ennis has revealed himself to be a quiet, but well-respected, veteran presence within the Leafs room as well. Through 47 games of the season to date, Ennis has 18 points (12 goals, six assists), and the winger once believed to be too small has skated in more than 500 NHL contests, and has nearly 300 points.